Aribert Reimann is not easy listening. His music is modernist with no trace of post-: dense, dissonant, non-tonal, and deadly serious. But his opera Medea was a surprise hit when it premiered at the Wiener Staatsoper last February, and in its first revival at the house it was not hard to see why. The libretto is clear as can be, the drama incredibly intense as well as emotionally accessible, and the music, despite its density, tells the story with a directness that is easy to hear even on the first time through. Reimann’s source material is not Euripides or Ovid or Seneca (or even Corneille) but rather the third part of Franz Grillparzer’s trilogy of plays The Golden Fleece (1822). Reimann adapted the text directly from Grillparzer without a librettist, Salome-style. This works well. The language and psychological world of the work feel remarkably modern, with complex characters who are all to some extent sympathetic. We begin as Medea and Jason seek refuge with King Creon in Corinth, and even many of the thematic concerns of the plot–Medea is a racial outsider who must discard her headscarf–feel all too relevant. The set represents a hilly, rocky landscape that could be the surface of the moon (and that is how much comfort it seems to give the characters). An austerely bare modern room sits stage left, rising and falling, sometimes stage level and sometimes connected to the ground by stairs. This is the home of the “civilized” world of Creon, and he and his tribe wear pure white while Medea, her nurse Gora, and her children wear colorful, vaguely Middle Eastern robes in warm red and purple. Jason acquires white clothes once he has been brought back into his former home, and the children do as well once they are adopted by Creusa. Reimann’s music is angular and violent, but each character does develop a distinctive voice. Orchestrally, there is a lot going on (particularly in the percussion section), but the balance is pretty good. Medea is one of those insane dramatic coloratura roles characteristic of post-war German opera, she is yet another suffering woman singing high Fs. (See also Die Soldaten, Simplicius Simpiccisimus, the ur-source Lulu, and almost anything else in the repertoire of Claudia Barainsky. Sometimes I wish Strauss had never opened Pandora’s coloratura box by composing my namesake.) Medea rages from high notes to low, skipping around everywhere in between. To my ear her music often sounded vaguely pentatonic, but this may have been my imagination used to pentatonic exotic characters. Jason’s music (lyric baritone) is no more stable but not as extreme in range. Creon is a muscular tenor of no great imagination or variety, and Creusa (lyric mezzo) gets the most memorable profile of all, a flurry of silly, bouncy coloratura showing her unknowing superficiality. The production is straightforward and effective. Jason forcibly leaving Medea in the ascending room stage left, she clinging to his hand, is a particularly memorable image. Medea’s magic disturbs the (volcanic-looking) rocks upstage–unfortunately as they roll down the hill their unlikely weightlessness is unmistakable. The blocking is impressively detailed for such complicated music (not to mention for a Wiener Staatsoper revival), and kept everything psychologically clear. Putting on Reimann in a repertory house is a major challenge, of course. The singers in this production were the same as in the premiere, with the exception of Claudia Barainsky in the title role (premiere cast Marlis Petersen was to appear in this revival but is ill; Barainsky sang the work’s German premiere this fall) and Stephanie Houtzeel as Creusa. Note that all these photos show the premiere cast. But all the singers were spectacularly good with this impossibly difficult music. Barainsky has a narrow, focussed soprano with considerable power. She made an earthy, instinctual Medea; according to some other audience members, Petersen was more aloof. Adrian Eröd was a smoothly sung, dramatically conflicted Jason, and Houtzeel sang Creusa with flowing tone and skipped around like she was in a Mozart opera. There wasn’t a weak link in the whole cast, really, Elisabeth Kulman’s dramatic Gora, Michael Roider’s Herod-like Creon, and Max Emanuel Cencic’s forceful countertenor Herold were all strong. Michael Boder did an excellent job balancing orchestra to singers. It’s hard to tell in this kind of score if everyone is together or not, but I did get the impression the orchestra was hanging on by the skin of their collective teeth at times. There were attacks that I believe were supposed to be together that were not. Passagework was dicey, and sections on opposite sides of the pit sounded questionably coordinated. But I’m not sure if I can really blame them for this. Next: Tomorrow night is the premiere of Il Postino at the Theater an der Wien, but I think I will be going next week. I’ll be at the premiere of the new Don Giovanni at the Staatsoper on Saturday for sure. 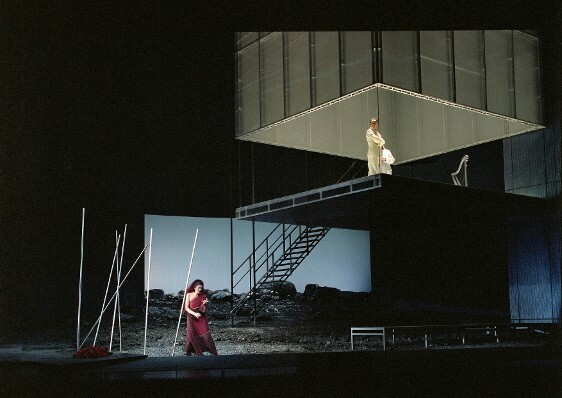 Production photos copyright Wiener Staatsoper. As soon as a DVD becomes available in the US I want to see this. Have you seen Pasolini's film version of Medea, staring Maria Callas after she retired from her opera career? If not you must. Her eyes are so evil in the movie, glorious! It the VPO/Lebrecht poster again. I went to the Don Giovanni Generalprobe this morning & I look forward to reading your thoughts on it. D'Arcangelo was saving his voice during the first act but seemed solid enough in the second, while Sally Matthews stood out particularly. 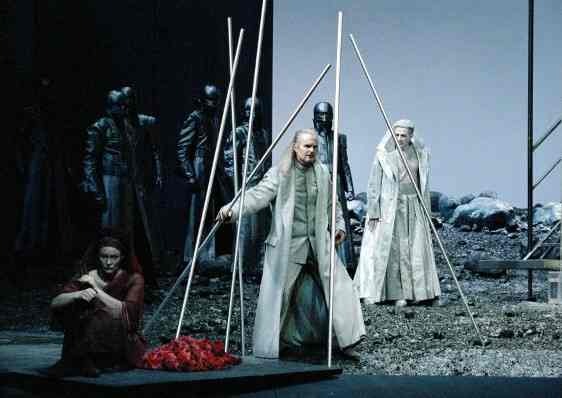 Elvira was a little disappointing and the Commendatore could have summoned up a little more presence; the sense of absolute authority that (I think) the judgement scene requires was slightly lacking. Martinoty was more of a dramaturg in the first act than in the second, and had he cut loose from convention a little more it might have been interesting. The playing was nicely polished, which means that either the orchestra knows this work too well or Welser-Möst got his demand for extra rehearsals. I think what applies to Martinoty applies to the production as a whole – if caution had been thrown to the wind it might have taken off more successfully. But maybe things will seem different at the premiere. Wow, thanks for the dress rehearsal report! I've never heard Matthews before so I'm glad to hear she's good. Sorry to hear that the production is cautious, but it's more or less what I expected. I'm missing the Met Don Carlo HD broadcast on Saturday because I'm going to this, I'll take live opera over broadcast opera any day! I guess it was disappointing because it initially promised to differ from the usual attempts to live down the house's conservatism (like the gloss of modernity, which always seems completely random, superficial and, often, plain weird – I remember a psychedelic fluorescent swan in Lohengrin). As I wrote, it was therefore refreshing to see Martinoty doing something intelligent and creative with the dramaturgy – there was an interesting conflation of the catalogue aria and Zerlina's wedding, for instance. Just a pity he didn't continue in this vein. I was speaking to an Austrian at the interval who commented that the price the regular audience exacts for tolerating silly postmodern sets is that dramaturgy according to 'original intent' is left intact; perhaps there's some truth in that, though I'm not entirely persuaded.